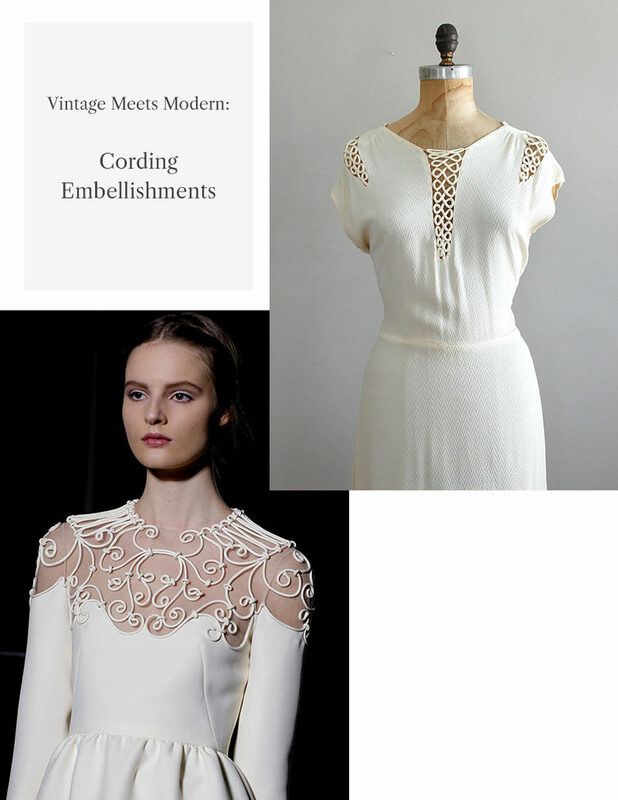 Images clockwise from top right: vintage dress from Dear Golden Vintage, Valentino couture spring 2013. Self-made cording is a beautiful vintage detail that has stood the test of time. This textural embellishment adds a touch of luxury and sophistication to garments like blouses and dresses. I am endlessly fascinated by embellishment and details. I never tire of comparing modern garments to their vintage counterparts. The vintage dress pictured above features a rouleau insert that creates a neckline that tiptoes the line between daring and demure. The modern Valentino dress also uses rouleau cording as a neckline detail, but instead of an insert, the trim is hand appliquéd onto a fine mesh yoke. Corded appliqué and inserts, like on the garments pictured above, involve hand sewing and time, making it hard for manufacturers to create them in factories. Luckily, with a little extra fabric and some hand sewing you can easily elevate your next sewing project—or update a past project—with this vintage-inspired detail. What is your favorite vintage detail? Share below! Thank you for sharing! Those wrought iron gates are absolutely stunning. Disappointed. The article is way too short and not much meat in it. Where’s the how-to instructions for this? Hi Mary, here is a link to one of our past tutorials with instructions on how to create this detail. I knew you had one.